I hope you will join us in spreading the word about this awesome Tesla Car Raffle benefiting the children of Big Brothers Big Sisters of Metro Atlanta. If you choose to post this to your blog or website, please notify me so we can keep track on our progress. Thank you so much for your contribution in changing the life of a child for the better, forever. Win the Car of the Future and Change the Life of a Child! ATLANTA, October, 2014 – Your dream car may be a Porsche, Mercedes or a Corvette, but have you ever dreamt of driving something different all together? The Tesla Model S is inarguably one of the best looking cars on the streets right now, and the all-electric luxury sedan has a range of over 260 miles on a single charge. And now the groundbreaking luxury car can be yours. We are thrilled to present the Grand Prize of the 2014 Car Raffle with proceeds benefiting Big Brothers Big Sisters of Metro Atlanta: the groundbreaking Tesla Model S all-electric luxury sedan valued at $92,470 (OR a certified check in the amount of $50,000, winner's choice). Simply purchase your Tesla Car Raffle ticket and you have your chance to be the winner. The price per ticket is $100, and you can purchase the S Bundle and receive 6 tickets for the price of 5 ($500). Ticket sales are limited to only 3,000 nationwide, and with less than two months to the official prize drawing on 11/21/2014 tickets are selling fast – so get yours now before it’s too late! Please go to http://www.bbbsatl.org/tesla to enter this unique opportunity to win the Tesla Model S.
The Grand Prize Winner choosing the Tesla Model S as their grand prize of choice will drive a car valued at $92,470 with black solid paint and an all-glass panoramic sunroof. The 85kWh vehicle features 19” wheels, Obeche wood gloss décor, parking sensors, tech package, tan Nappa leather seats, and an ultra high fidelity sound system. The Tesla Model S has been selected as Consumer Reports' Best Overall Car for 2014 and Motor Trend’s Car of the Year in 2013. The winner is also eligible to receive complimentary detailing and Opti-Coat ceramic coating application (valued up to $2,000) courtesy of Atlanta’s own Peach State Detail. The mission of Big Brothers Big Sisters is to provide children facing adversity with strong and enduring, professionally supported one-to-one relationships that change their lives for the better, forever. As the largest one-to-one mentoring organization in the Southeast, Big Brothers Big Sisters of Metro Atlanta (BBBSMA) currently serves approximately 3,000 youth in one-to-one relationships on an annual basis. Enter today at http://www.bbbsatl.org/tesla for a chance to drive the future, and change the lives of children for the better, forever at the same time. 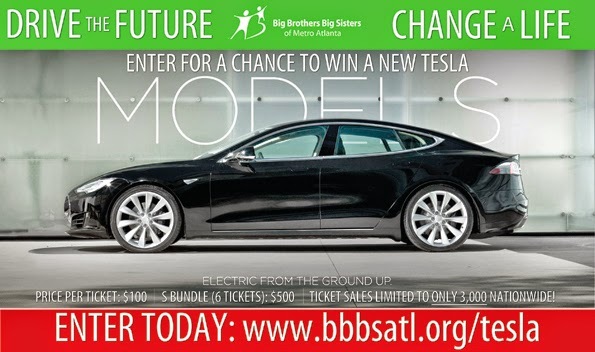 Big Brothers Big Sisters of Metro Atlanta and its 2014 Car Raffle are not endorsed by nor affiliated with Tesla Motors, Inc.